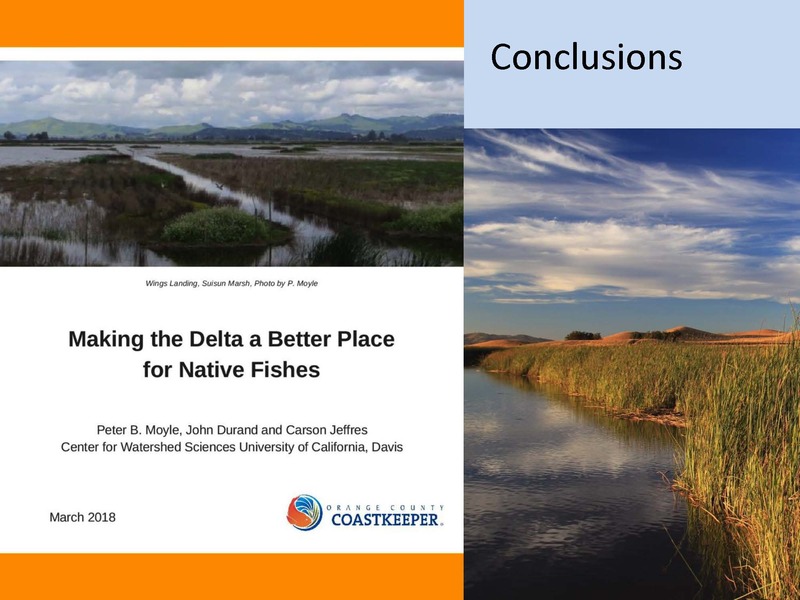 In March of 2018, the UC Davis Center for Watershed Sciences on behalf of Orange County Coastkeeper released an innovative report titled, Making the Delta a Better Place for Native Fish, which focused on ecosystem-wide restoration and reconciliation ecology. The paper recommends 17 actions which can be taken to improve conditions for fish, including some that can be implemented immediately and others that will take longer. 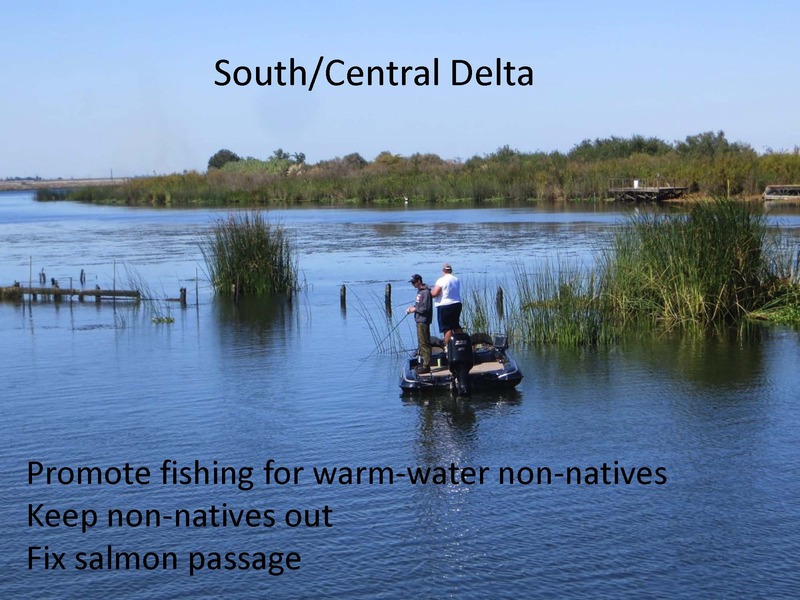 The science-driven fish-oriented report provides a fresh and realistic perspective to promote and expedite the restoration of native fish species in the Delta. Peter Moyle, Professor emeritus, Department of Wildlife, Fish Conservation, and Biology, and associate director of the UC Davis Center for Watershed Scientists. He has authored or co-authored more than 250 publications. His research interests include conservation of aquatic species, habitats, ecosystems, ecology of fishes in the San Francisco Estuary. 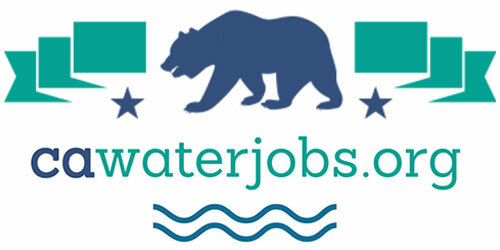 Garry Brown, Executive Director and CEO of Orange County Coastkeeper. A native of Orange County, he is committed to expanding the Coastkeeper’s presence as a proactive results-oriented organization that uses coalition building and partnerships to find effective solutions to environmental problems that impact our communities and watersheds. John Callaway, Lead Scientist of the Delta Science Program at the Delta Stewardship Council. 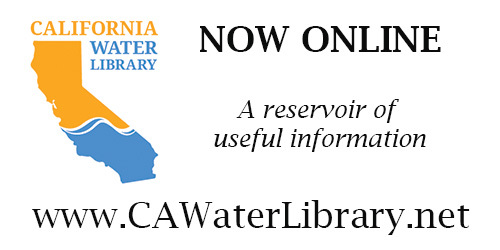 The science program has a mission to provide the best scientific information for water and environmental decision making in the Bay Delta system. His research focuses on wetland plant soil ecology with a particular emphasis on wetland restoration, climate change effects on tidal wetlands, and wetland carbon dynamics. 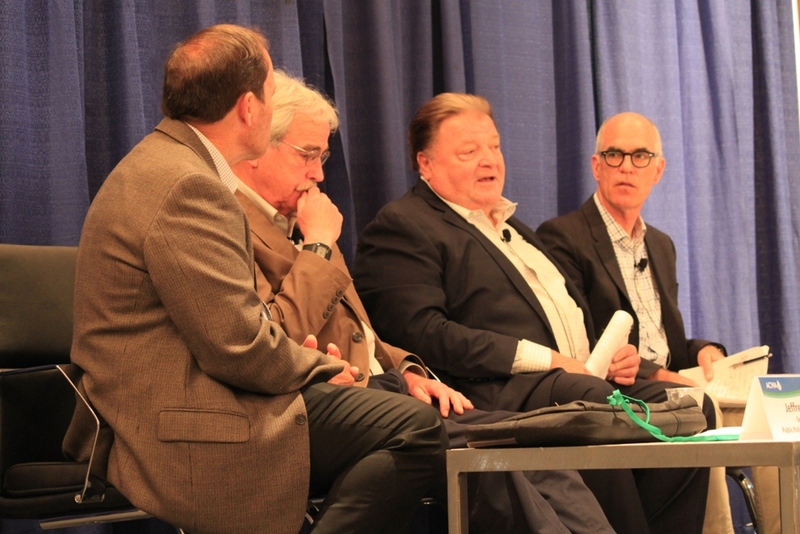 The panel was moderated by Dr. Jeff Mount, senior fellow at the Public Policy Institute of California, an emeritus professor at the UC Davis Department of Earth and Planetary Sciences and founding director of the UC Davis Center for Watershed Sciences. 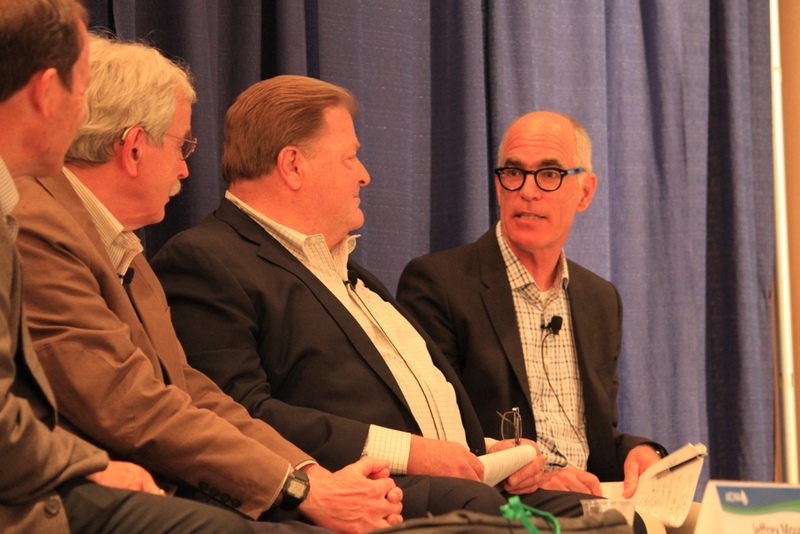 Dr. Jeff Mount began by reminding that the Sacramento-San Joaquin Delta is the most intractable water problem in California and has been for decades; oftentimes, it is described as a wicked problem – a problem that cannot be solved. 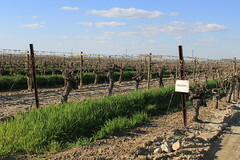 But the fact is that 25 million people depend on a portion of their water supply from the Delta, as does 3 million acres of irrigated agriculture in one of North America’s richest agricultural region, so the stakes associated with the Delta are exceptionally high, he pointed out. 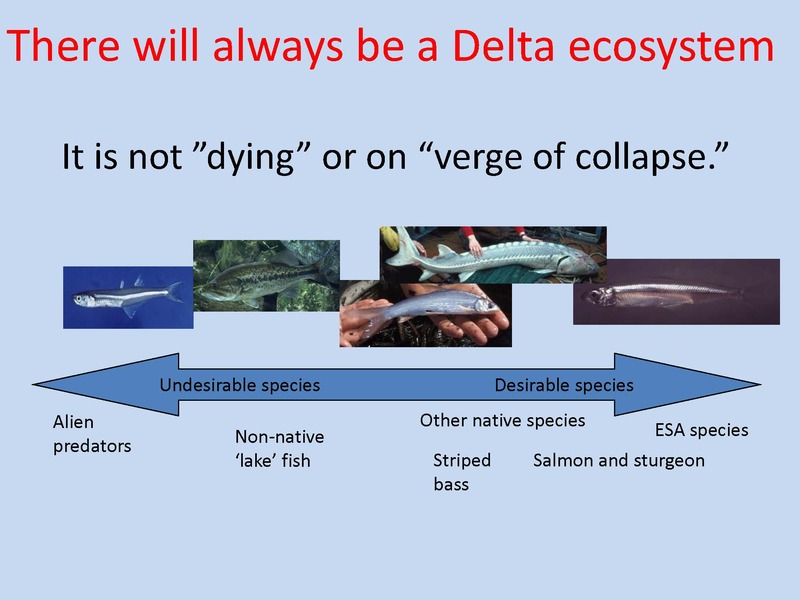 Dr. Mount acknowledged that the ecosystem isn’t the only issue in the Delta; there are others, but the focus of the discussion today will be on the Delta’s ecosystem. Dr. Peter Moyle then gave an overview of the report, Making the Delta a Better Place for Native Fish, which was coauthored by John Durand and Carson Jeffres. Dr. Moyle began by presenting a slide from the book Forgotten Landscapes of California by Laura Cunningham. The Delta today is a very different place; there were massive wetlands, full not only of wildlife and fish, but also very large numbers of Native Americans were living on this landscape; it was a very dynamic system and still is, he said. 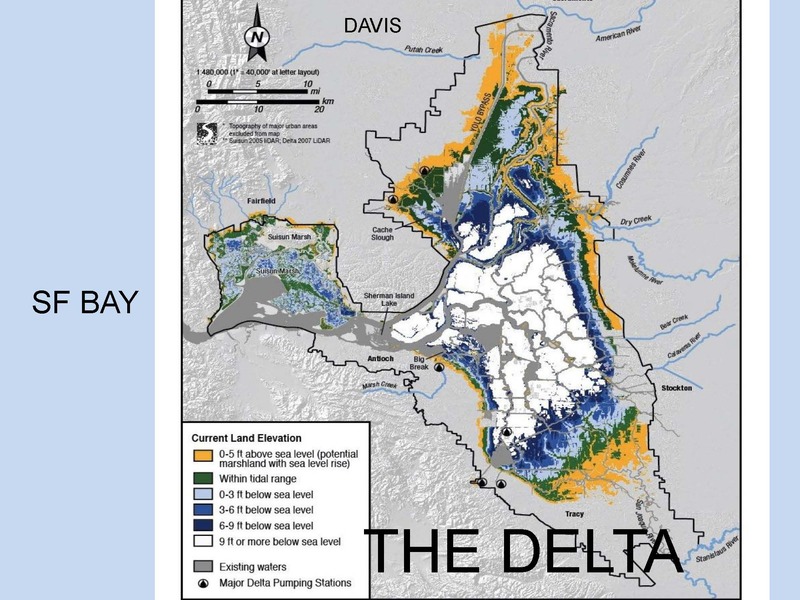 A high percentage of the Delta is below sea level; the area shown in white on the map are areas of the Delta that are 9 feet or more below sea level, so this is a system which is very different from what it was historically, he said. Dr. Moyle said he’s been sampling and studying fish in the Delta since 1972. In any given sample, there are about 50 species, a mixture of native and non-native species with the non-natives tending to dominate. There are success stories; the Sacramento splittail is having a resurgence right now which Dr. Moyle attributed to the restoration projects. The later runs of salmon are not doing well, but there are a lot of opportunities to fix conditions for salmon, which are the fish that people especially care about. “If we make a Delta that functions well for salmon, we’ll have done a lot towards making it functional for other fishes as well,” he said. 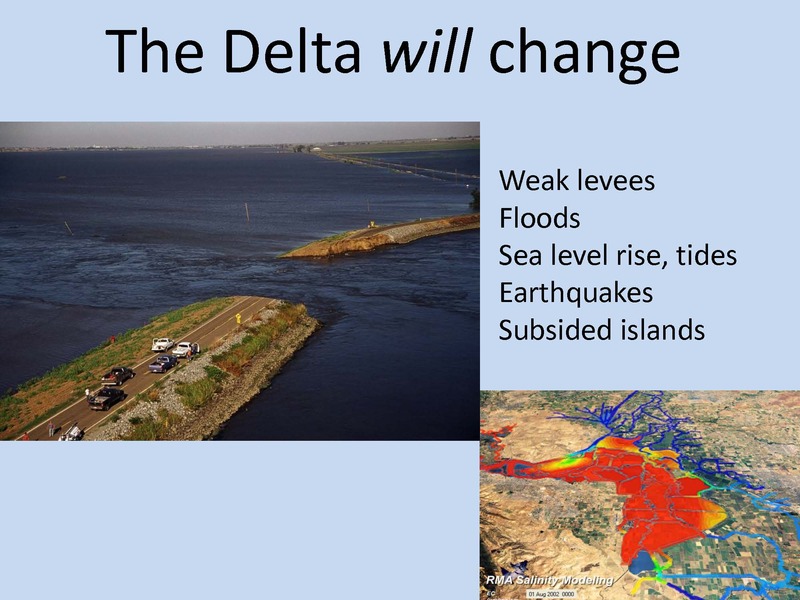 Dr. Moyle said that he thinks about the Delta as two major systems that are linked together, but also quite different. 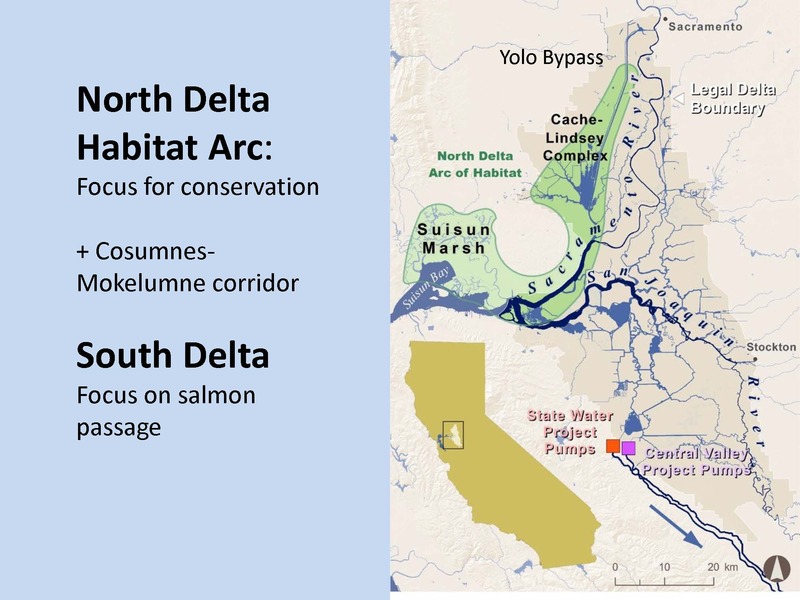 For the north Delta, they are proposing ‘the North Delta Habitat Arc’ which starts at the Yolo Bypass, goes down through the Cache-Lindsay Slough complex to the Sacramento River, past Rio Vista and extending into Suisun Marsh; it also includes the Cosumnes-Mokelumne River corridor. 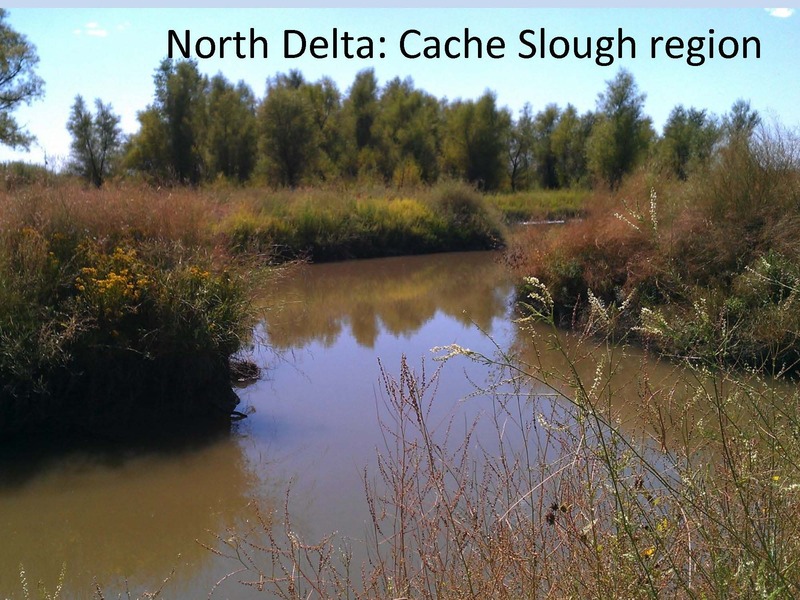 The report focuses mostly on an area Dr. Moyle calls the North Delta Habitat Arc because that is the focus of the report as that’s where most of the restoration efforts are likely to be successful. 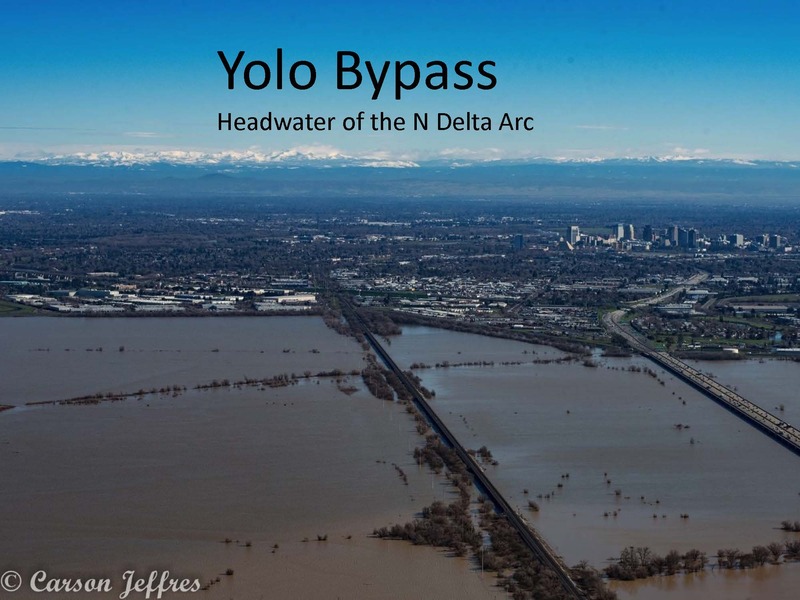 Dr. Moyle noted that the PPIC has published extensively on the Delta; he recommended the 2007 report, Envisioning Futures for the Sacramento-San Joaquin Delta, and the followup, Comparing Futures for the Sacramento-San Joaquin Delta. 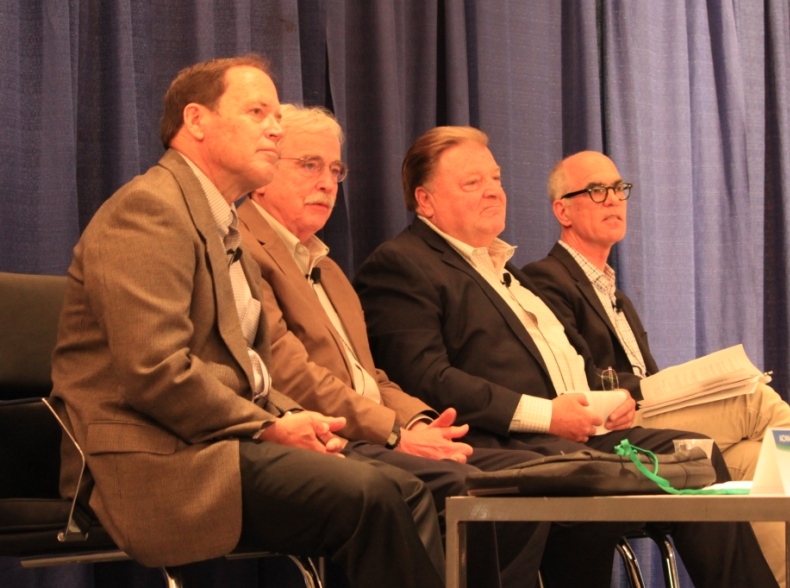 He said many of the ideas that are expressed in the paper were developed during the discussions that produced these books with multiple authors with very different backgrounds. 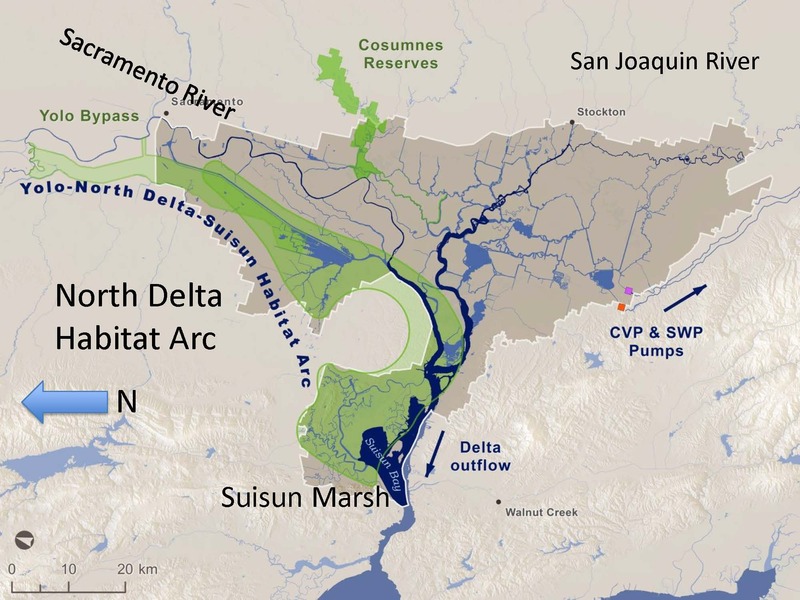 Why is Orange County interested in the Delta? Moderator Dr. Jeff Mount kicked off the discussion by asking Garry Brown why the Orange County Coastkeeper would be interested in what’s going on in the Delta. “The third great thing was the discussion about giving the environment water rights, which makes some people nervous, and I think that is coming closer in time,” he said. 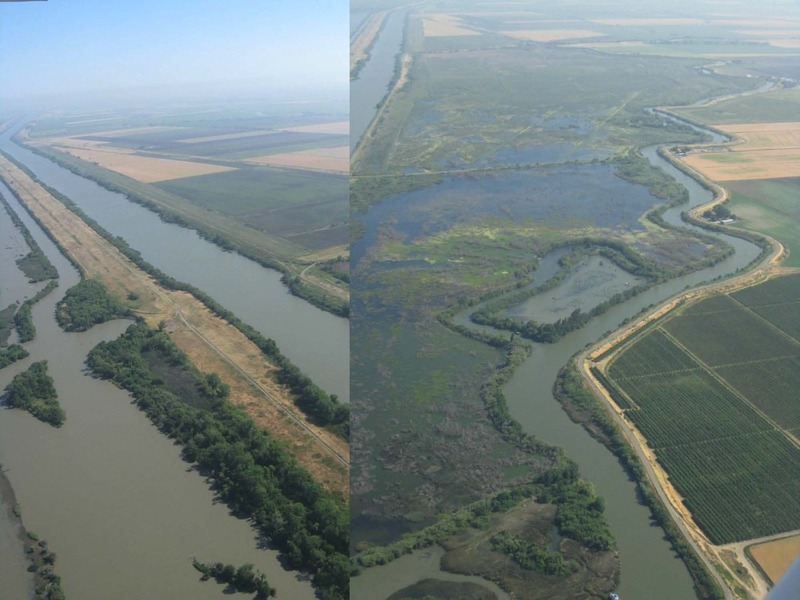 How does the Delta Stewardship Council view the approach suggested in the paper? Moderator Dr. Jeff Mount asked Dr. John Callaway, the Lead Scientist for the Delta Science Program and science advisor to the Delta Stewardship Council, how the Council views the reconciliation ecology approach which is moving away from single species based management which is driven principally by ESA issues and to a lesser extent, water quality issues. And secondly, what are his own personal views? This restoration is going to be expensive. 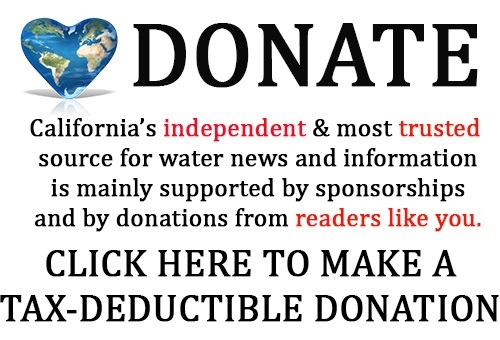 How can Southern California help pay for it? For ages, Southern California has viewed the Delta as Northern California’s problem, except that Southern California gets a significant amount of water from the Delta, said Dr. Mount. So how does Southern California help pay for this? Have you had any discussions on how you might do that? How does this approach interface with the Water Quality Control Plan update, currently underway at the State Water Board? “Are we well organized for that?,” asked Dr. Jeff Mount. What about predation on endangered salmon by non-natives? The levees have been here since early 1900s; why the recent declines? 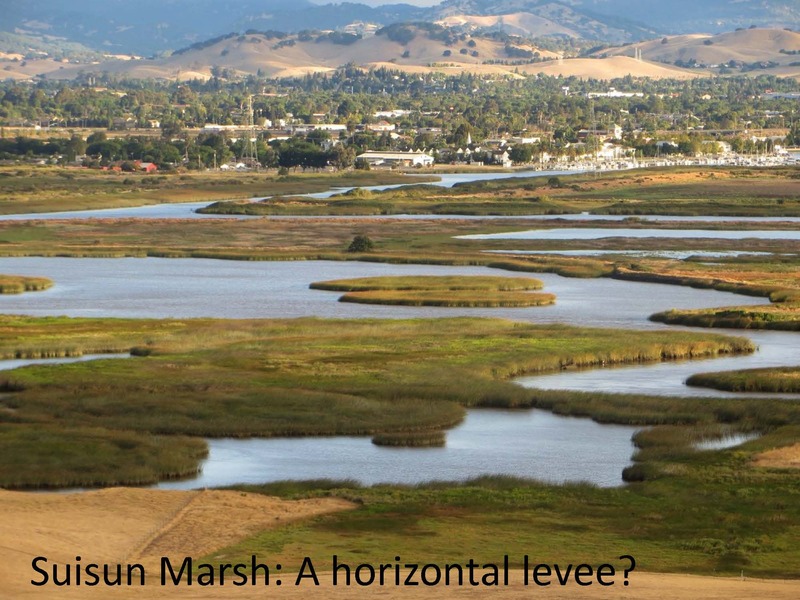 Audience question: For Dr. Moyle, you certainly pointed out very clearly how the levees and channels have removed most of the native aquatic habitat, and yet most of that happened well over a century ago. The populations are declining more recently, so what’s the issue with the time lag? Is there something else going on that’s causing the more recent population declines? How does agriculture fit into the North Delta Arc? Audience question: You talk about the North Delta Arc. How much of this is a surrogate for the lost opportunities in the rest of the Delta, central south, as opposed to a restoration or even something that might have been a natural condition? Follow-up question: How do you reconcile that with the agriculture in these two counties, Yolo and Solano, which is centuries old at this point? … I’m asking you how you’re reconciling – when you look at three cows on the other side of a levee, you’re looking at somebody’s lifestyle, somebody’s farm. And you’re not looking at historic wetland; you’re looking at something that may be something that wasn’t there historically … but you haven’t addressed the issue of what the system owes the landowner in this case. Are the regulators receptive to these new ideas? 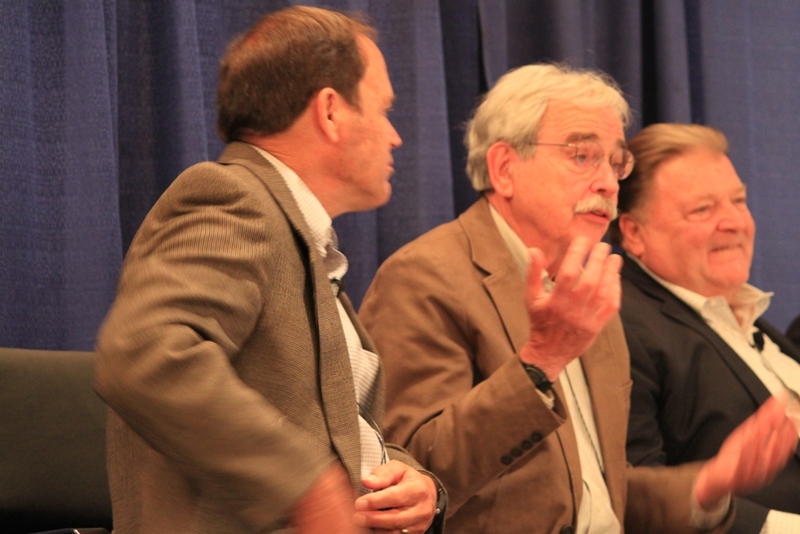 Question: Ken Weinberg, Delta Stewardship Councilmember, asked if there was a sense of urgency? Are we losing these windows of opportunity, and if we take too long to take action, are we going to be restoring something less function, something different, something less desirable? 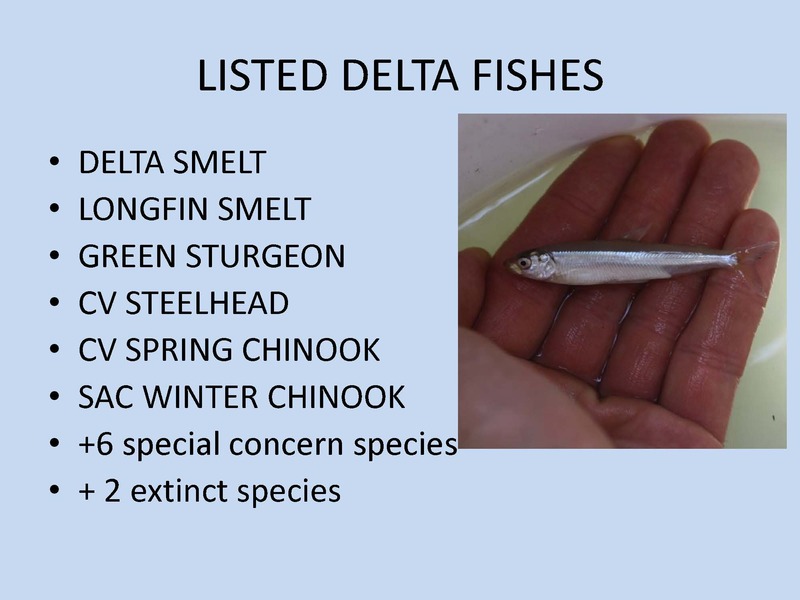 What about the Delta smelt we have in captivity? Question: “The science question is how can we use that incredible resource of the captive Delta smelt that are at Clifton Court today? We can’t even seem to use them in science experiments … how would that asset play into getting smelt healthy again? Where do we go to have this conversation about making the Delta a better place?